A unique combination of adaptogenic herbs in capsule form and a powdered blend of daptogens, superfoods, powerful greens, and hemp protein for adrenal restoration. The perfect combination! 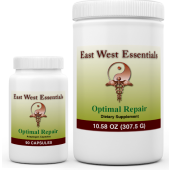 Optimal Repair Adaptogens capsules are powerful tonic herbs that have traditionally been used for adrenal restoration to restore what has been lost due to stress and fatigue. They support the body’s ability to recover faster from the physical and mental stresses of daily life. Optimal Repair Blend powder goes beyond nutritional therapy by also featuring a proprietary blend of adaptogens, which come from powerful tonic herbs that have traditionally been used for adrenal restoration to build the body and restore what has been lost due to stress and fatigue. These support the body’s ability to recover faster from the physical and mental stresses of daily life. 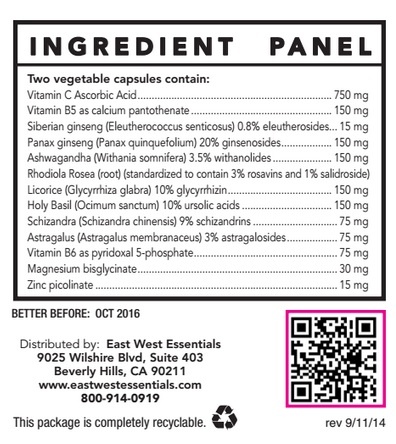 East West Essentials Optimal Repair Blend is a highly nutritious organic superfood and superfruit blend known to provide phytonutrients and antioxidants that play important roles in maintaining your health and wellbeing.It has been created to provide a synergistic balance of support from real foods. Optimal Repair Adaptogens are formulated for the expedient recovery from damaging physical or mental stress on the body that can be caused by extreme dieting, extreme workout programs, illness, overwork or other stressors that compromise our body’s core health. Optimal Repair adaptogens recharge the adrenal glands and other hormone management systems, managing your body’s hormonal response to stress. This allows the body to more effectively balance out stress-related hormones, such as cortisol, to normal levels. Optimal Repair Adaptogens support your core energy. . they also helps your body “adapt” better to day-to-day stressors, which can increase your energy levels and improve sleep cycles. Optimal Repair Adaptogens help balance the body’s overall function to enhance your ability to lose weight. Optimal Repair Blend was formulated for the expedient recovery from damaging physical or mental stress on the body that can be caused by extreme dieting, extreme workout programs, illness, overwork or other stressors that compromise our body’s core health. Take 3 capsules daily or as recommended by your healthcare practitioner. Blend shake or briskly stir one scoop of Optimal Repair Blend powder into 6-8 oz of chilled water or as directed by your healthcare practitioner. Adjust amount of water to desired sweetness and/or thickness. Wheat, soy, corn, grains, gluten, eggs, dairy, caffeine, harmful additives, preservatives, fillers, bleaching agents or hexane. Optimal Repair Adaptogens contain licorice (Glycyrrhiza glabra), therefore patients with hypertension should only use this product under the care of a healthcare practitioner. If you have any major health concerns, check with your healthcare practitioner before use. Keep out of reach of children. Do not use if pregnant or lactating. Keep tightly closed in a clean, dry place. No refrigeration necessary. I suffer from hypothyroidism and this duo fits perfectly with the medication I take for that. I checked with my doctor and he highly recommended this combination. It really perks me up and keeps me going. I love it! Already feeling more mental clarity and alertness and it's only been 1 week so far. Stupendous. Heather at East West Essentials recommended I take these two together while training for my first 10k marathon. 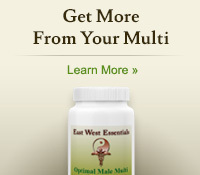 It was so super easy to take both and they really amped my energy and helped me zap extra pounds. I've continued to take them regularly because I feel great. My two favorite products, sold together! I can speak volumes for how these have completely changed my energy levels, sleep cycle, and cortisol management. Love love love both of these! I'm a personal trainer and I recommend these products to all of my clients. They're good for you and they work! I love that you can get these two products together! I practically live in the gym and by taking these I'm never sore or exhausted from a workout! I absolutely love how this product's taste & how easy it is to mix with the Optimal Protein Powder. It's the perfect way to start my day & after the 1st week I felt thinner & more balanced. I'm starting week two today & can't wait to see what happens. Amazing product. I lost a few pounds, my energy was through the roof, and my skin and hair were healthier than ever. I do it a few times a year and would recommend it to anyone. Oh, and the bonus is that it's not difficult to do and you'll probably change a few of your bad eating habits when you're through because of how good you'll feel eating clean food. My doctor told me I had issues with my adrenals and hormones and suggested I try the Optimal Repair Blend. I have been taking it for 6 mos. now and I can't believe the difference. It was so much easier for me to lose weight after the first month and I can now keep it off for once in my life. I started with twice per day and now I take it once per day. Have been using Optimal Repair Blend for several months now and I'm feeling so much better! Before I was dragging home from work every day with no energy left to do the things I enjoy. On top of that I would have trouble sleeping!! After Optimal Repair I am feeling more stable and have an increase in energy throughout the day (so when the day is over I can get a good nights sleep). Now I use it in my morning shake with fruit during the week. So happy I have found what I need to help with my stress and heavy workload. Thank you East West Essentials!!! This product has made a huge difference in my skin. Before my skin was so dull and dry and looked super aged. I had read about taking these antioxidants to help repair my skin and decided to try the Optimal Repair Blend. I immediately noticed a huge difference. I have gotten so many compliments on my skin just from a single change in my daily routine. This product is great (and it's only like 35 calories)! I have not been able to lose weight for years. I know something had changed because I used to be able to lose weight without too much effort. 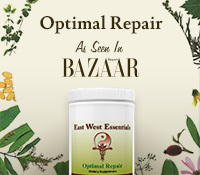 I started using the Optimal Repair two months ago and now I feel like I am not so sensitive to everything I eat and have finally lost most of the weight. (I like to add in one scoop of the Optimal Protein Powder and use them together in the morning). I feel like my metabolism is back to like when I was younger.